Which Binding Should I Choose? 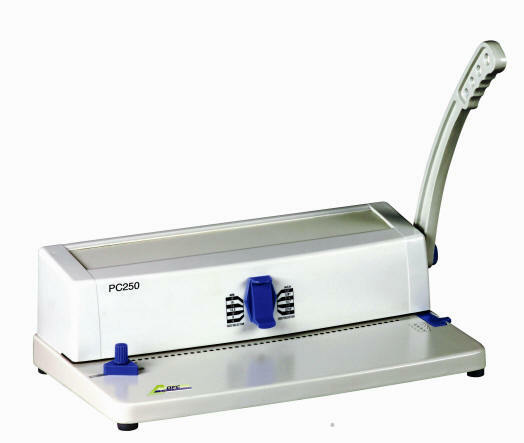 Plastic coil binding is the newest form of mechanical binding and is the fastest growing. It consists of a plastic element that typically has 4 holes to every inch. Plastic coil is very resilient and ideal for mailing, or other long term applications. The pages can be turned 360˚ and the book can lie flat, this makes coil binding an ideal choice for manuals, business reports, and workbooks. Made entirely of sturdy die-casted metal rather than flexible sheet metal, the ETitanCoil is the most heavy duty, reliable, user-friendly, and functional machine in its class. DFG chose to use die-casted metal for the entire machine rather than using sheet metal for the punching surface to ensure your machine is solid and does not bow. The ETitanCoil uses an encased lubrication system that drastically reduces friction and punch pin wear, which equates to longer machine life for the end user. By encasing the lubrication, you are guaranteed to never have lubrication spots on your punched pages. DFG uses similar designs on our new high-speed commercial punches that cost over $10,000. This is part of DFG's commitment to taking the extra step to deliver the best machine possible. Utilizing the world's first full disengagement-pin design (recently copied by other manufacturers), punched paper is free from partial punches, on any size project. The disengagement-pin design uses independent coil spring mechanisms on each pull pin that allows the pins to disengage with a crisp snapping action. Our 6 inch coil roller is all the rubber you need. Simply start the coil by hand and then touch it to the rubber roller. Your hands unconsciously will move the book as the coil is wound through the paper. 6 inch rollers are the professional standard. With our specially designed Hi-Torq™ motor, torture tested for 3,000,000 cycles, the ETitanCoil takes coil binding to the next level of convenience and ease. 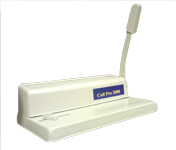 The ETitanCoil can punch 25 sheets of 20 lb paper with the gentle push on a foot pedal, eliminating the manual punching strain on staff members. A combined 450 years experience led to DFG producing a machine with the most sophisticated design, testing methods, and manufacturing techniques to develop the most rigid heavy duty chassis in its class at 29% less overall machine weight. The ETitanCoil is ETL certified, which means it has been thoroughly tested by an independent third party to ensure the highest safety standards are met. Want to learn more about safety certification? Visit our ETL vs. CE comparison page. Call DFG at (800) 480-4DFG for a quote today. DFG improved upon its already best-selling desktop coil binding machine to give you desktop hardcover binding. Statistics show that hardcover binding could soon become the mainstream standard of professional document binding in the United States. The DuraPunch super-premium punching tool is made of the world's best materials. They are hardened and heat-treated in a precision environment, then fitted with an oversize paper gate to offer DFG customers the finest machine for hardcover binding and take desktop coil binding to the next level. Internal high-efficiency lubrication system is totally sealed and comparable to the punching dies of six-figure equipment. The TitanCoil T3 is capable of punching up to 30 sheets of 20lb paper in one swift motion. The TitanCoil T3 uses an encased lubrication system that drastically reduces friction and punch pin wear, which equates to longer machine life for the end user. 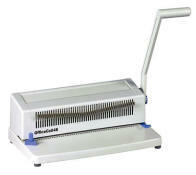 By encasing the lubrication, you are guaranteed to never have lubrication spots on your punched pages. DFG uses similar designs on our new high-speed commercial punches that cost over $10,000. This is part of DFG's commitment to taking the extra step to deliver the best machine possible. Our 6 inch coil roller is all the rubber you need. Simply start the coil by hand and then touch it to the rubber roller. Your hands unconsciously will move the book as the coil is wound through the paper. Made entirely of sturdy die-casted metalrather than flexible sheet metal, the ETitanCoil is the most heavy duty, reliable, user-friendly, and functional machine in its class. DFG chose to use die-casted metal for the entire machine rather than using sheet metal for the punching surface to ensure your machine is solid and does not bow. The TitanCoil Ultra is capable of punching up to 28 sheets of 20lb paper in one punch. Metal-Coil Compatible Roller: Continuous-duty rollers with precision bearings for extended life, especially using plastic coils. The TitanCoil uses an encased lubrication system that drastically reduces friction and punch pin wear, which equates to longer machine life for the end user. By encasing the lubrication, you are guaranteed to never have lubrication spots on your punched pages. DFG uses similar designs on our new high-speed commercial punches that cost over $10,000. This is part of DFG's commitment to taking the extra step to deliver the best machine possible. The TitanCoil is capable of punching up to 25 sheets of 20lb paper in one punch. 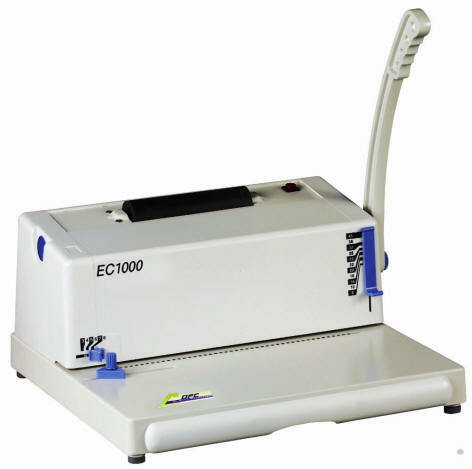 Made of a sturdy die-casted metal base and a strong plastic housing unit, the EC1000 is a heavy duty, reliable, user-friendly machine. 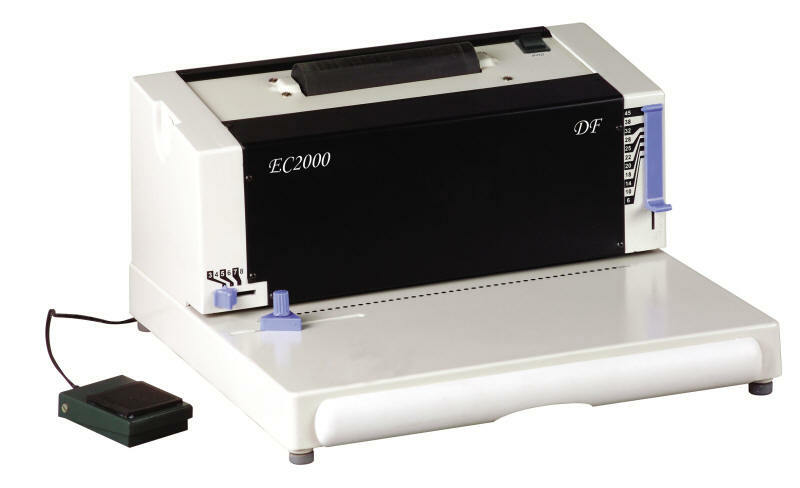 The EC1000 is a manual punch and electric binding machine. It is perfect for offices, POD rinters, and copy shops. 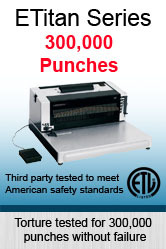 This machine can punch upt to 25 sheets of 20lb paper in one punch. Made of a sturdy die-casted metal base and a strong plastic housing unit, the OfficeECoil46 is a light duty, reliable, user-friendly machine. This machine can punch upt to 15 sheets of 20lb paper in one punch. Sturdy metal construction: up to 15 sheets of 20 lb. Electric Power Binding: foot-pedal activated roller significantly increases productivity and greatly reduces operator fatigue. Made of a sturdy die-casted metal base and a strong plastic housing unit, the OfficeCoil46 is a light duty, reliable, user-friendly machine. 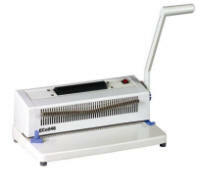 The OfficeCoil46 can punch up to 15 sheets of 20lb paper in one punch. 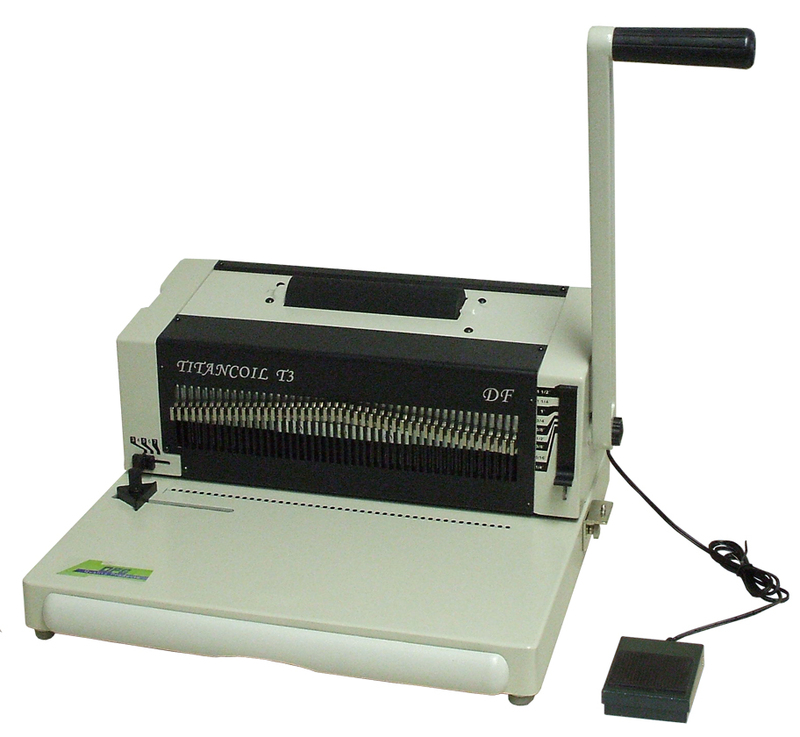 The OfficeECoil46 is a manual punch and binding machine. It is perfect for offices, POD printers, and copy shops. The TitanCoil Ultra is capable of punching up to 25 sheets of 20lb paper in one punch. The MC2000 can punch up to 25 sheets of 20lb paper in one punch which makes it perfect for POD, quick printers, copy shops and larger corporation offices. Made of a sturdy die-casted metal base and a strong plastic housing unit, the MC1000 is a heavy duty, reliable, user-friendly machine. 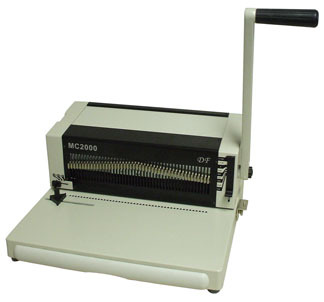 The MC1000 is a manual punch and binding machine. It is perfect for offices, POD rinters, and copy shops. Bind any size/thickness book with the long lasting CoilPro 2000, the absolute best machine to bind your documents right in your home or office.